PERHAPS had "The Great Gatsby" (http://www.ow.ly/kU8b0) come wrapped in modern clothing like "Much Ado About Nothing," a certain someone would have liked it so much better. 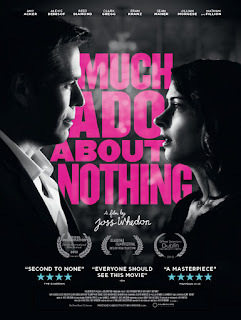 Joss Whedon's present-day treatment of the Shakespeare classic opens today in Los Angeles, New York and San Francisco. It had its world premiere at the 2012 Toronto International Film Festival. "Much Ado About Nothing" is fun, fun, fun! (See video above). Of course, virtually everybody knows that in the end bickering Beatrice and Benedick will wind up together. The delight, though, is in seeing the circuitous, contemptuous journey that Amy Acker and Alexis Denisof, respectively, take to reach that destination. Ditto for Don John's (Sean Maher) dastardly scheme to destroy his host, Leonato (Clark Gregg), by any means necessary, including using the man's poor, innocent daughter, Hero (Jillian Morgese), as collateral damage. Comparisons to Kenneth Branagh's critically acclaimed 1993 film are inevitable but not relevant; KB hued much closer to the original text. JW’s “Much Ado About Nothing” has greater kinship with another Shakespeare work that was infused with modernity: 1996’s “Romeo and Juliet” starring Leonardo DiCaprio and Claire Danes in the lead roles. There, of course, the similarities end. The latter is a weighty tragedy, while the former is a frothy comedy that keeps the laughter happy and bright. All's well that ends well. And so is "Much Ado About Nothing." “Much Ado About Nothing is rated PG-13; visit http://www.muchadomovie.com/#home to learn more about the film.